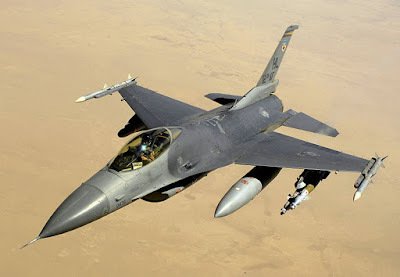 Astitva - Search for an Identity: US Selling F16 To Pakistan To Combat Terrorism.... Really? US Selling F16 To Pakistan To Combat Terrorism.... Really? Last time when I checked, none of the terrorist groups operating in Pakistan had an air force. Forget air force, they don’t even have a single plane. If logic for selling the equipment to Pakistan is to combat insurgency, then why F16? I believe for counter insurgency; attack helicopters are better suited than a full-fledged fighter jet. Why don’t sell them attack helicopters instead of modern, versatile multi-role fighter plane like F16(training and radar equipment as well)? I don’t think Pakistan is going to use F16 to bomb their own territory; when the need of time is attack helicopters. I think this plane will find its way to its eastern borders than the fluid one at west. As per ‘The Diplomat’, “Back in March 2015, the U.S. House Committee on Foreign Affairs froze $150 million in foreign military financing and put a hold on the delivery of a number of used U.S. Navy cutter vessels since they were not deemed essential in fighting militants in Pakistan.” If the house committee didn’t block the deal, then these cutter vessels may already with Pakistan Navy. How these cutter vessels will help in combating insurgency in Pakistan’s western border, which is far away from sea? Pakistan already operates 70 F16s. May be 13 more F16 A/B is already on the way from Jordan. In between 2010 and 2012, US sold 18 new F16 C/D Block 50/52 planes to Pakistan; this is in addition to 14 used F16 they delivered in that year. It is believed that coming batch of 8 will be more advanced than anything Pakistan received till now. There is a catch here. Though the sales program is under FMS (Foreign Military Sales), it might be the US tax payers who will pay 46% of cost to Lockheed Martin on behalf of Pakistan Government for 8 F16 planes. This deal is valued at $699mn. What a wonderful deal!!! Another problem I am finding here is, US is selling weapons to both India and Pakistan which are loggerheads with each other. What is point of buying weapons from a country which is selling advanced weapons to our opponents as well? Its indeed ridiculous. Assume a future war where India and Pakistan fights with each other using US provided planes and bombers...!! !